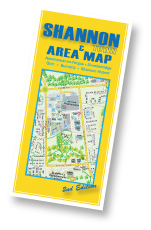 Showing residential areas, B&B's, Hotels, Commercial & Industrial Areas; Public Buildings, Places of interest. Available from bookshops in Ennis at €8.95. 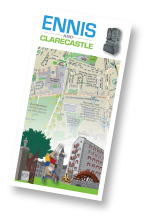 Residential; B&B; Hotels; Commercial & Industrial; Shannon Airport; Local History. Available from McLoughney's, SkyCourt, Shannon & local garages €6.95. Real Time Kinematic (RTK) GPS surveying provides centimetre-level accuracy in real-time from GPS measurements made by field recievers. This system of GPS surveying & mapping does not require post processing at a later point and provides accurate real-time positioning on-the-fly. Elevations or other adjustments can be made on the spot - reducing the need for subsequent site visits with obvious cost reduction benefits. True North provides RTK GPS services using dual frequency base and rover GPS receivers on a contract basis for area mapping, civil construction, setting out, and other functions requiring a high level of accuracy in X,Y & Z axis. Our fee structures are based on a daily or part-daily rate, project rate or by other agreement. The service includes equipment & operation. Network control or base station occupation points are normally provided by others. For a quotation for your requirements you can complete the form below or give us a call to discuss your needs.